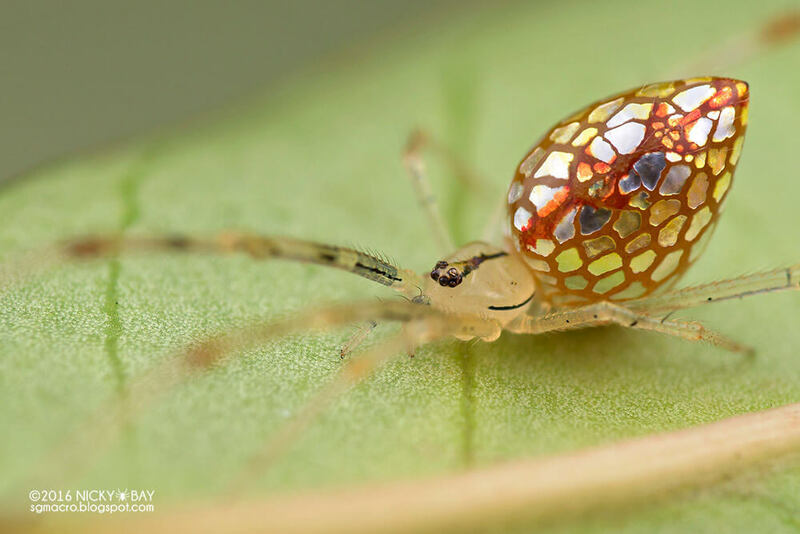 For the last several years Singapore-based photographer Nicky Bay has been documenting the life of the mirror spider, an unusual arthropod whose abdomen is covered in bright reflective panels that appear almost metallic. Bay recently noticed that some of the spiders exhibit unusual behavior in addition to their shiny appearance: apparently the spiders are able manipulate the mirrors in situations where they might feel threatened. In some instances the gaps between the silver plates almost completely disappear creating a larger reflective surface. Bay continues to update his original post about the mirror spiders on his blog with new photography, and you can see a massive archive of macro insect photos on Flickr. For several years, I have been observing the odd behavior of the Mirror Spider (Thwaitesia sp.) where the “silver-plates” on the abdomen seem to shrink when the spider is agitated (or perhaps threatened), revealing the actual abdomen. At rest, the silver plates expand and the spaces between the plates close up to become an almost uniform reflective surface. That is why I called it the Mirror Spider. You can see some of Bay’s amazing photography on his Flickr page.